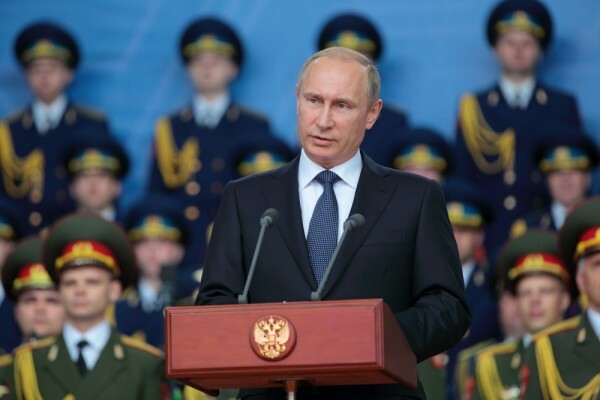 Is Putin Preparing a Governmental Purge? As he does once a year, last week President Putin spend over three and a half hours answering 80 questions out of the 3+ million questions which were received. The show, which was aired live on Channel One, Rossiya-1 and Rossiya-24 TV channels, and the Mayak, Vesti FM and Radio Rossii was an unprecedented success which was watched and commented upon by millions of Russians. You can read the full transcript of the show by clicking here, and the transcript of a conversation between Putin and the journalist corps following the show here. First, Putin is the unchallenged and beloved leader of all the Russian people, he is an extremely effective manager, a defender of the simple Russian people everywhere and he is the last recourse for those who have been wronged by the authorities. Let me add here that all the opposition party heads fully agreed with this. Right now, nobody in Russia dares to criticize Putin personally, not because some KGB goons are going to come in the night and drag him away to a concentration camp, not at all, but simply because bad mouthing Putin is now tantamout to political suicide. Even some members of the non-system political opposition (aka 5th columnists) are realizing this now. Second, a lot of Russian people are hurting, badly. Not because of sanctions or the drop in the prices of gas and oil, but because of the corruption, incompetence and ideological blindness of the “economic block of the Russian government”. The economy is a mess due to corrupt governors, lazy government bureaucrats and outright sabotage by a quasi-universally hated “economic block of the government”. Sanctions (especially the denial of credits) and the fall in the price of oil do make things worse, but they are not the real problem or even a major part of the problem. Third, the individuals responsible for this mess are regularly mentioned by name. This hatred for the “economic block of the government” is never openly encouraged by Putin himself who, when directly asked, praises the work of the government’s ministers. Everybody else, however, including all the opposition figures and even the host Vladimir Soloviev, is now openly calling not only for resignations but even for jail terms for the guilty governors and even ministers. While Medvedev himself is rarely the personal target of such denunciations, Arkadii Dvorkovich (Deputy Prime Minister), Igor Shuvalov (First Deputy Prime Minister), Alexei Uliukaev (Minister of Economic Development) and Anton Siluanov (Minister of Finance) are now “openly hated” on Russian TV. For example, when a woman calls in to denounce the horrible condition on the main road of her city and Putin promises to take action, all the commentators agree that it is a crying shame and a disgrace that only the President is willing to listen to such concerns, while all those who are directly responsible for such matters are indifferent, are doing nothing or, even worse, corrupt to the bone. Another example: workers treated like slaves by a gang of thugs on an island of the Russian Far East have complained to the local police and prosecutors and were completely ignored. One call to the President, and the Russian Investigative Committee (roughly the equivalent of the US FBI) will now investigate not only the mobsters involved, but also the local police forces and regional prosecutor himself. As for Putin, he personally apologized to these workers in the name of the entire Russian government. By the way, it is well known in Russia that the local bureaucrats are absolutely terrified by these call-in shows with the President, as they never know who might call. What they do know is that the investigation and sanctions “from above” will be swift and merciless. As for the Russian general public – he absolutely love it. Still, there is a strong sense that as soon as the call-in show is over, all those who did not get caught this time are breathing a huge sigh of relief and are immediately returning to their (bad) old ways. The truth is that there is only that much that such an event can deal with and that it is, alas, very much in the Russian mentality to hope that “maybe” (авось) the next again “another guy will be caught but not me”. And thus very little changes in reality. I should add that some Ministers receive extremely high praise on Russian TV. These are Foreign Minister Lavrov, Defense Minister Shoigu, Lieutenant-General Vladimir Puchkov (Minister of Emergency Situations), Dmitri Rogozin (Deputy Prime Minister of Russia, in charge of defense industry, a ministerial-level rank) and a few others. Notice an interesting pattern here? All the the “Putin allies” (I call them Eurasian Sovereignists) are getting high marks. All the “Medvedev allies” (whom I call “Atlantic Integrationists) are getting all the blame. Not only that, but the worse the economic situation becomes, the better Putin and “his” men look and the worse all the “westernizers” in power look. In fact, the latter now are openly blamed for it all. Trust me, seven and a half hours of Atlantic Integrationists bashing on Russian TV did not “just happen” by some coincidence. In Russian way would say that Putin is clearly “digging under” (which could be translated as “scheming against”) the 5th columnists in power. And now let’s look again at the nomination of Viktor Zolotov as the new Commander-in-Chief of the Russian National Guard. As I wrote in my initial commentary about this, I do not think that Putin needs any Praetorian Guard to protect himself, not with the Military and Special Services solidly behind him, not to mention some 85% plus popularity rating. However, I do think that the position is Commander in Chief is important enough to make the person holding it a member of the Russian Security Council. And, in fact, Putin did make Zolotov member of this body which gives the “Putin camp” a very powerful ally in a top position. True, Putin did remove another powerful ally from the Security Council, Boris Gryzlov, the Speaker of Russia’s State Duma and Chairman of the Supreme Council of the United Russia Party, but he did so to have him in charge of the “Ukrainian policy” of Russia (Gryzlov will now represent Russia at the Contact Group on the Ukraine). But that is an advantageous trade for Putin, because even of both Gryzlov and Zolotov are equally loyal to him, Zolotov bring a lot more “muscle” to the table. Besides, with the Ukraine now clearly in its death throes, a real Putin-man needs to be on top of the situation as things are about to get very serious there. There is another most interesting development taking place: the meteoritic rise of Putin’s “All-Russia People’s Front” or “ONF” which is, by itself, quite an amazing organization. Let’s look into this unique phenomenon. The ONF is not a political party, at least not officially, but a movement of “like-minded political forces”. Still, Putin is the official leader of the ONF. His co-chair and, I would say, acting leader is Stanislav Govorukhin, a very talented and popular film director who is very ideologically close to Putin (and to the late Alexander Solzhenitsyn, would I add). The ONF is an immense patchwork of private individuals, social and political organizations, entire corporations, unions, clubs, social organizations, government agencies (such as the Russian Post Office or Rail Service) and many other entities. Officially, the ONF shares the strategic and tactical goals of the President’s “United Russia” Party, so this begs the question of what the main difference between the two is? 1) This is the main non-governmental “organizational tool” Putin has to know what is really going on in the country. The ONF is always at the forefront of all the denunciations about corruption, nepotism, bureaucratic abuse, administrative incompetence, etc. The ONF creates special investigative groups which put a great deal of effort into finding and reporting what is really going on in the country. Recently, ONF activist made a survey of over 65’000km or roads in Russia and reported to the President and the general public a rating of each and every one of these roads thereby exposing the governments, cities and towns who let the road infrastructure decay to public criticism. In fact, the ONF plays a key role in Russia as a type of “watchdog for the President” and the ONF is regularly featured in Russian TV and its leaders are often guests on Russian talk-shows. 2) The ONF also makes it possible for Putin to completely bypass the United Russia party apparatus and deal with the Russian public directly. More relevantly, the ONF could be turned into a “regular” political party literally overnight. Thus, if there was an attempt inside the United Party to somehow weaken Putin or to otherwise take action against him, Putin would have the option to create a nation-wide “Putin Party” almost instantly. 3) The ONF is extremely dangerous for the local mobsters and the corrupt politicians who cannot dare to use their usual intimidation tactics against the ONF lest they get a visit from an FSB SWAT team acting directly on the order of the ONF Chairman, Vladimir Putin himself. Precisely because the ONF is clearly Putin’s personal and much beloved creation, nobody in his/her right might would dare challenge or, even less so, threaten it. 4) The ONF is a big pain in the rear for all the government agencies who are supposed to be responsible for overseeing the situation inside Russia. When the ONF unveils a case of the corruption of a local governor or the plight of factory workers who don’t get their salaries for months, this begs the question of what the responsible government agencies paid to monitor such situations are doing. Each government agency and minister know that they are in direct competition with the ONF. Worse, the ONF might even begin investigating them. A very scary thought. Let’s bring it all together now. The worse the economic situation in Russia is, the stronger Putin becomes and the weaker the Atlantic Integrationists are. Therefore, far from trying to conceal the economic problems in Russia, Putin and his supporters are constantly and publicly speaking about them. Putin is now clearly using the ONF as a tool to take action against the corrupt local authorities. Furthermore, Putin is also using the ONF as a way to denounce the various forms of sabotage committed by the 5th columnists while deflecting any criticisms from himself. At the same time there is a massive media ongoing PR campaign directed directly at the “economic block” of the government who, it so happens, is composed solely of “Atlantic Integrationists” and Medvedev allies. And just to make sure that all his bases are covered, Putin bring an ally with a lot of “muscle” into the Security Council. Does this indicate that Putin is preparing purge of the 5th columnists? I am neither a prophet nor a mind reader. I cannot tell what Putin is planning or what the future holds. But I think that when we look at all the facts listed above we can say that they certainly seem to point in that direction. And if we look at the way Putin deal with similar challenges in the past we also can observe a pattern. Putin has a history of deliberately letting a situation rot before taking action. In 1999 Putin did wait for the invasion of Dagestan and the Moscow city bombings before ordering the a Russian counter-attack which developed into what became known as the 2nd Chechen War. In the Ukraine Putin let the Ukronazis lead a massive attack on Novorussia not once, but twice, before allowing the Novorussian to successfully counter-attack and force the junta to sign Minsk-1 and Minsk-2 agreements. In Syria Putin waited until Daesh was threatening Damascus before ordering a very limited but most effective Russian military intervention. Putin haters will say that the man is weak and indecisive and that in each situation he should have taken action much earlier. Maybe. But my sense is that Putin likes to take action only once he let a situation become so bad that his action seem like an already unhoped for miracle. This kind of “psychological preparation of the battlefield” would be, I think, very typical of how the Russian secret services operate. I also believe that this approach is the key to the entire Russian policy towards what is left of the Ukraine today. In theory, instead of Putin, it could also be a “deep insider” like Sergei Ivanov, Chief of the Presidential Administration of Russia, who could be coordinating such a pre-purge campaign, especially if there are reasons to avoid having untrusted members of the Security Council in the loop. But my gut feeling is that Putin likes to be in control, especially of crucial developments. Whatever may be Putin’s final goal, what is certain is that no government can indefinitely survive the kind of constant political thrashing the Medvedev government has been increasingly subjected to in the Russia media. Again, I should immediately add here that we are not talking about a situation where the media criticizes “the government” in the sense of “those in power”. In the Russian case, the media is heaping praise on the President and the Ministers which are associated with him, while very deliberately targeting either the so-called “economic block” or the government (as opposed to the Presidential Administration). It is all very carefully focused. On one hand, 2016 will be an important elections year in which the Russian people will elect a new Parliament. Furthermore, the risks of yet another, desperate, Urkonazi attack on Novorussia is very real, if only to distract the public from the apocalyptic domestic situation in the Ukraine. On the other hand, the Russia economy might well come out of its slight, but real, recession and the inflation numbers are steadily getting better. Is that a good time to initiate the purge of the government? Maybe. One possible scenario would be that the opposition parties (Communists, the Liberal-Democrats of Zhirinovsky and the Fair Russia Party) would do better than expected in the next elections. That could give Putin a pretext to get rid of the “economic block” and replace these Ministers with members of the Communist Party (believe it or not, even if Ziuganov looks like an old Brezhnev era figure, there are quite a few very sharp and interesting young(er) leaders in the CP). One way or another, I have a strong feeling that the “economic block” of the Medvedev government will not last to the end of the year.